Concept art from Laika’s new animation, set in ancient Japan, takes centre stage in this stunning art book. 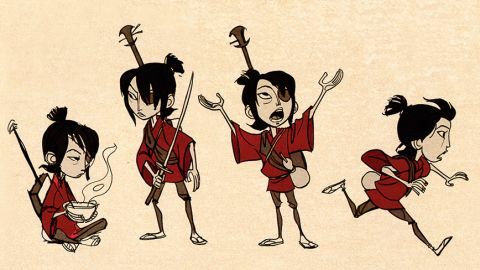 The Art of Kubo and the Two Strings is a treasure trove of concept art and artist insights, all presented beautifully and eloquently. Kubo and the Two Strings, the latest animation from Laika, is set in ancient Japan and follows the adventures of a boy on the run from a vengeful spirit. This book offers a fascinating look behind the scenes of its making, illustrated by acres and acres of lush concept art. Following a foreword by Laika president Travis Knight and an introduction by author Emily Haynes, the book begins by explaining the experimental design of The Woodblock Effect, the source of the signature look Laika has given this film. This expressive texture is, we learn, drawn from the work of Kyoshi Saito, a woodblock printmaker in the Sosakuhanga art movement of 20th century Japan. The book is divided into three main sections that follow the chronology of the film’s story: Home, Quest and Return. You’re greeted by a constant stream of incredible concept art, including character and environment designs, each credited to the individual artists (a point so many film art books, sadly, fall down on). While the book is more of a visual feast than a heavy textual read, there’s a fair amount of exposition on the page, typically from film production leads rather than concept artists. For example, David Vandervoort, lead 2D facial animation designer, explains how sketching a full range of emotions for Kubo was a challenge because of his overflowing hair and eye patch. Director of photography Frank Passingham details the challenge posed by casting a white monkey against a snowy background, while assistant art director Phil Brotherton explains how the interior design of Beetle’s cave reflects his internal conflict between packrat bug and noble warrior. The main event here, though, is the (mainly digital) concept art. Ean McNamara’s epic evocation of Kubo’s mother, looking lost on a cliff’s edge; the thrilling magnificence of Kubo’s trek towards Hanzo’s fortress, depicted by August Hall; Trevor Dalmer’s menacing Hall of Bones painting; Andy Schuler’s breathtaking underwater scene, and beyond... the vibrant colours and intricate details are all reproduced beautifully. This review was originally published in ImagineFX magazine issue 141. Buy it here.